Shortly after winning the November 2008 election President-Elect Barack Obama appointed Los Angeles Mayor Antonio Villaraigosa to his Transition Economic Advisory Board. Formerly Hillary Clinton's campaign co-chair, the appointment of Villaraigosa was seen as a unifying move, a nod to Clinton Democrats, to Latino voters and to Los Angeles, California and the West Coast. It was even more than that. It was a gesture of solidarity to the California left, second only to Chicago as a crucible of the "peoples movement" that brought Obama to power. It was a salute to a man whose rise to power, in many ways paralleled Obama's own. Obama was born in Hawaii in 1961, Tony Villar as he was known then, was born in Los Angeles in 1953. The Lincoln School was run by the Chicago Communist Party. Koji Ariyoshi was a leader of the Hawaiian party which controlled the ILWU affiliated Honolulu Record- which Davis went to work for. Australian born Harry Bridges was a long time leader of the ILWU. The US government fought for years to deport Bridges for his ties to the Communist Party-which Bridges understandably would never admit. The Communist Party front Committeee for Protection of Foreign Born (CFPFB) spent considerable time and money keeping Bridges in the US. Frank Marshall Davis was listed as CFPFB endorser as late as 1973-three years after he began mentoring the young Obama. Years later it was revealed that Bridges was not only a party member but served on the party's powerful Central Committee. Antonio Villar like Obama was raised without a father and went off the rails as a teen, before straightening himself out to study law. According to the New Yorker, Antonio Villaraigosa has a long friendship with serving California state senator Gilbert Cedillo-who is a close associate of Obama's new Labor Secretary, Communist Party linked Hilda Solis. Movimiento Estudiantil Chicano de Aztlán (MECHA) is a radical Chicano seperatist group with a strong Marxist-Leninist underpinning. Peoples College of Law was founded in 1974 “by people and organizations, including the Asian Law Collective, the La Raza National Lawyers Association (LRNLA), the National Conference of Black Lawyers (NCBL), and the National Lawyers Guild (NLG). The NLG was for decades closely associated with the Communist Party. Villaraigosa visited Cuba with the Venceremos Brigade, a radical group. 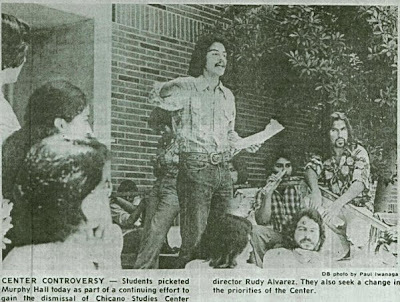 And he and Cedillo became deeply involved in Centros de Acción Social Autónomo, or CASA, an immigrant’s-rights organization led by the Mexican-American labor activist Bert Corona, and worked on its newspaper, Sín Fronteras. “At CASA, we wanted to organize the undocumented into unions, instead of seeing them as a threat,” Cedillo said. The Venceremos Brigades were founded in the 1960s by activists, many of whom would later join the terrorist Weather Underground Organisation. Later it became (and remains) a largely Communist Party operation and still sends an annual quota to Cuba to harvest sugar cane and at least in the past, undergo terrorist training. Bert Corona, who died in 2001, was an icon of the Californis left. Most sources claim that Corona never joined the Communist Party, but did work with party members and fronts for many years. Other sources claim he was indeed party member, at least for a time in the 1940s. During the 1940's, Corona was an organizer for the International Longshoreman's and Warehouseman's Union (ILWU) and was identified in Congressional testimony as a Communist Party USA inside that union. That's right Frank Marshall Davis's favourite union, the ILWU. How long Corona remained in the Communist Party is unclear, but there is no doubt that Corona was very close to Harry Bridges. Corona came to Los Angeles to study at USC, where he went to work and was caught up in the labor ferment of the late 1930s. He became president of Local 26 of the International Longshore and Warehouse Union, and a political ally of Harry Bridges, one of U.S. labor's most progressive and democratic leaders. After Corona was fired from ILWU position union over an internal dispute Harry Bridges, also a major figure within the communist dominated Congress of industrial Organisations (CIO) offered Corona a job as a CIO organizer. Barack Obama and Antonio Villaraigosa have a common benefactor in Harry Bridges. Had Bridges not helped Frank Marshall Davis and Bert Corona back in the 1940s, the Obama and Villaraigosa might not hold the positions they do today. I wonder if that thought ever occured to them as they sat across a table planning America's future? I should also point out that Villaraigosa has won his re-election campaign with little opposition. The media didn't even hardly mentioned his opposition at all. The Radical Oborg is Here!